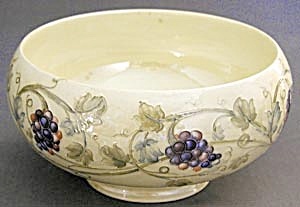 Magnificent Grape and vine pattern on a soft yellow lime background with overall surface luster bowl. Grapes are in shades of dark blues to red violet. The vines and leaves are in shades of olive to mint. The whole design has a raised outline. Bowl has a slight ring base. Light crazing. Inside has some discoloration under glaze. 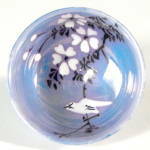 Signed on bottom W. Moorcroft. 3 3/4" high x 7 1/2" diam.